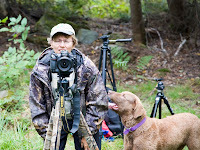 The Viewfinder Blog of Eastern Maine Camera Club: Nugent's Camps - Where's the Moose At? Nugent's Camps - Where's the Moose At? September 18 to the 20th was quite an experience. Mary's two and a half hour travel estimate to the bridge at Chamberlain Lake proved quite accurate. I was riding with Dave Hacker and AJ Whitney when we shot across a substantial bridge. I thought I caught sight of a sign on the Ranger Station that said Chamberlain. So, I suggested we turn around. Good thing, because we were in the right place. We pulled out the Gazetteer anyway, and must have looked a little pitiful to the ranger. He came over and straightened us out as to our location. We were quite early. Could have stopped along the way, but did not. Ruth York beat us there, and was in the parking lot. The wind was very fresh down the flowage. Whitecaps, in fact. I have to admit I was quite nervous about a boat ride to the camps. Chamberlain is a big lake. If there are whitecaps in a relatively sheltered flowage, what would the lake hold for us. I took a few minutes to assess what amongst my posessions would float. I had a nice dry bag with my clothes inside. I figured that would float and was big enough for me to ride for a time. If I could muckle on to a paddle, maybe I could paddle my way to shore in a pinch! The caretaker from Nugent's arrived in a modest boat. He had a bit of trouble getting onto the dock. Not a good sign. He looked a wee bit pale to boot. He got out and asked me how I felt about getting to camp via solid ground. "Wicked good idea!" I replied. I felt much better. The rest of the goup arrived shortly. Several of us piled into Nugent's Suburban, and I jumped in with Chuck Rohn. It was a short drive to the vehicle parking area, and a modest walk and ATV ride to the camps. Our accommodations were excellent, even without running water. I don't think anyone was especially unhappy. The main lodge was very clean, and more importlantly, the food was plentiful and excellent! wind whistled around our cabin all night. At the lake in front of the camp was a lovely pattern of white frothy ribbons from shore to shore. I was thinnking about more coffee, and maybe a good book. We had the coffee, but all I had to read was my D90 manual. I didn't see much intrigue in the manual. So, out we went. The wisdom was to stay on dry ground. I was all for that! We drove to a location where moose were rumored to hang out. Many tracks and other sign, but no moose. That led me to figure the moose were either smarter than ourselves, or their presence was local folklore. I'd like to think we are smarter than the moose, but let's not rush to judgement. 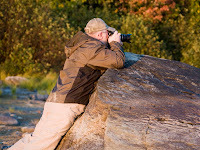 One of our members set up a photographic ambush along the road. No lack of ambition in our group! or two. No such luck. last used when logs were rafted down the lake during the days of log drives on the Penobscot watershed. Lots of debris. Many adult beverage bottles. I wonder what they did in their spare time? Things got better on Sunday. Two boats were rented and we struck out down the lake for a look at abandoned locomotives and an abandoned log tram. Chuck Rohn and Kerry Woodberry took the tillers on our boats. We discovered a treacherous landing on the other end. Lots of water too shallow to make it to shore in the boats, or too many rocks and boulders for our vessels. We had a couple desperate men to boot. Funny sight to see several of us wade ashore on our bare feet carrying our boots. Some things can't wait. No names mentioned, you guess. I have many more images to share, but I'm about to scream at this blogging software. Maybe I need coaching at the blogging thing!!!! The upshot is, great time despite the weather. Nugent's took great care of us. I'll be happy to eat Stella's food anytime, and Rob and Stella are good hosts. Thanks, very much, to them!! I use photography a means to socialize with others. I enjoy encouraging others in this endeavor.